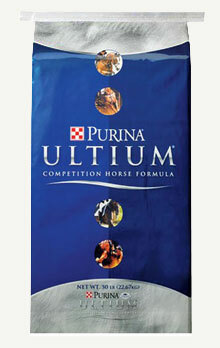 Purina Ultium Competition Horse Formula is nutrient dense and highly efficient so you actually feed less. Pellets and extruded nuggets prevent sorting, reduce waste and transport easily contains a blend of three fuel sources that provide a steady flow of energy for developing and growing foals. Powerful antioxidants destroy free radicals and bolster a healthier immune system, reducing muscle damage. Website by: Krista Computers Inc.